Corrosion is the breakdown of metals due to oxidation or chemical reaction. Well water can become corrosive and cause problems with your home's water delivery system by slowly dissolving pipes, fixtures, and fittings. Corrosive well water may have a metallic or bitter taste due to the metals leached from rocks in your aquifer, or from metal in your home's plumbing. Another sign of potential corrosive elements in your water includes blue-green staining from dissolved copper or small leaks in your home's plumbing system. Low water pH is the most common cause of corrosion. The EPA recommends that water pH levels be kept between 6.5 and 8.5 – a pH of 7.0 is neutral. If your water has a low pH it can begin to dissolve copper pipes and, if your home was built before 1987, the lead solder used in your home's plumbing system. Low pH water typically has a low dissolved mineral concentration. This is known as “soft” water. Some dissolved solids are necessary to control corrosivity and they also give water its “taste.” Typically concentrations are between 50 to 150 milligrams per liter depending on the minerals that are dissolved. The EPA suggests dissolved solid levels be no higher than 500 mg/L. Some typical elements that may be dissolved include bicarbonate, calcium, magnesium, nitrate, sodium, and phosphate. If your water supply is found to be corrosive, there are several options available to address the issue. The option you choose depends on the situation you are dealing with. 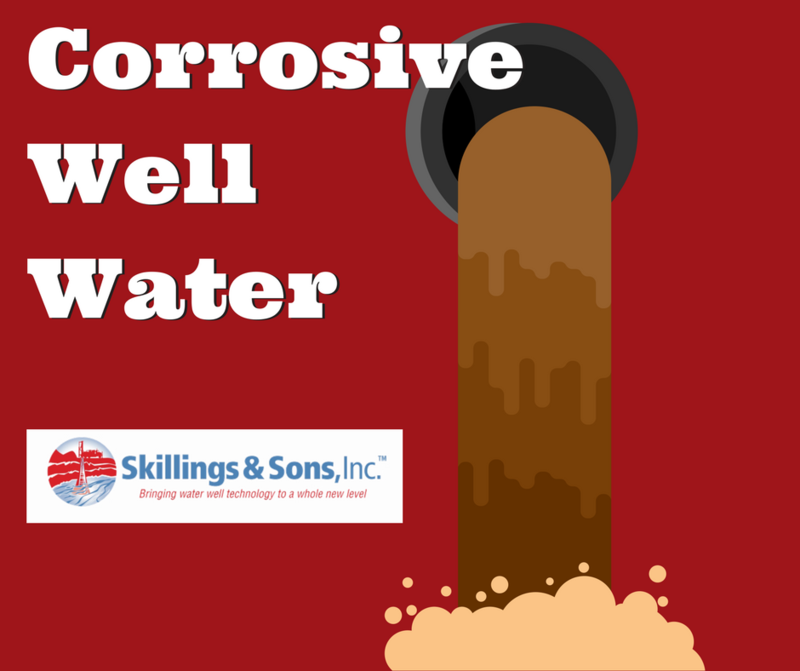 Your well water professional can offer you information and the best option for treatment. Replacing your plumbing may be a viable option if the length of the run is short. The entire length of pipe from your drinking water line should be replaced otherwise corrosion will continue in the remaining pipes. PEX or plastic plumbing is a good alternative. Make sure any PEX installed is certified for potable water use. Certified PEX will contain the code “NSF” and “Drinking Water” on the side of the pipe. Low pH is the most common cause of corrosive water. This problem can be treated relatively simply with neutralizing beds of calcium carbonate or other alkaline materials like magnesium oxide. This is typically done in a point-of-entry system that treats your water as it enters your home. The system is designed to add calcium to the water to raise the ph to a neutral 7.0. Reducing the corrosivity is the ideal solution. You can install equipment to remove the dissolved metals. For example, water softeners can reduce iron levels. Two common iron treatment options are catalytic oxidizing filters and oxidation filtration systems. If iron bacteria is also present then additional treatment such as chlorination may be necessary. Lead and copper can be reduced or eliminated with activated charcoal filtration, Reverse Osmosis or distillation. Although the level of corrosion may not be significant enough to cause failure or effect cooking, the levels of dissolved metals like lead or copper may be above EPA Maximum Contaminant Levels. These metals can leach out of your plumbing in proportion to the length of time the water is in contact with the plumbing of your home. The highest concentrations are typically in the water first used in the morning after resting in plumbing overnight. To make sure levels are low for these metals, test before first use. A second sample should be tested after the water has run for 3 to 5 minutes. If the second sample is safe, the water may be consumed as long as the plumbing lines have been flushed. If drinking water is needed throughout the day, a pitcher filled with this flushed water may be stored in the refrigerator for later consumption. Flushing to clear your pipes is a temporary solution. Relatively inexpensive Point-of-Use treatment systems can be installed that remove metals at specific taps around your home, for example in the kitchen and bathroom. Point of Use systems only treats small amounts of water for drinking and cooking. Reverse Osmosis and activated alumina absorption systems are Point-of- Entry systems that are especially effective at removing lead and copper before water enters your home's plumbing system.